You’ll enjoy 2 vacations in 1 – a relaxing Orlando resort getaway plus an extraordinary cruise to The Bahamas! Enjoy a VIP Welcome Party and 2 nights in a spacious 1-bedoom villa at one of our luxurious Orlando resorts. Experience Orlando’s famous theme parks & attractions or simply enjoy our many exclusive on-site resort activities. Relax and let us provide hassle-free, complimentary transportation directly from the resort to nearby Port Canaveral. It’s better in The Bahamas! Enjoy a luxury cruise to the white sand and turquoise waters of this Caribbean oasis. Get ready to experience a fun-filled, action-packed Land & Sea getaway, guaranteed to create a lifetime of memories. First enjoy a magical luxury resort stay in Orlando, FL, the theme park capital of the world. Then set sail on a fabulous Caribbean cruise to the beautiful Bahamas where you’ll find adventure along the palm-lined beaches and turquoise waters. Following your Westgate Resorts stay, you’ll hit the high seas for a fun-filled adventure to The Bahamas. Don’t miss out on this dream vacation where you’ll enjoy the best of both worlds – on both land and sea! What is a Land & Sea vacation? Our exclusive land & sea vacation is a unique getaway that combines a fun-filled, two-night resort stay in sunny Orlando, FL with a 3-night Caribbean cruise to The Bahamas. You’ll have an opportunity to experience shopping, dining and world class attractions like Disney World. 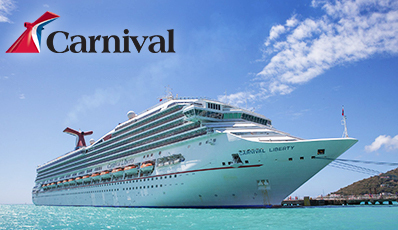 Then, we will provide you with convenient transportation from Orlando to nearby Port Canaveral for your cruise. Where is the resort stay? The land portion of this land & sea vacation includes two nights at one of Westgate’s luxurious Orlando resort properties. You will enjoy a spacious one-bedroom villa offering all the comforts of home as well as a long list of resort style amenities ranging from tropical swimming pools and miniature golf to onsite dining, paddle boats and more. U.S. Citizens on closed-loop cruises (that begin and end in the same U.S. port) and travel to destinations in Mexico, Canada, the Caribbean, The Bahamas, and Bermuda are able to re-enter the United States with proof of citizenship other than a passport or passport card. You can use an original government-issued picture ID (i.e. driver's license) AND an original government-issued birth certificate or original Naturalization Certificate. What is per couple pricing? Our special land & sea vacation includes the Orlando resort stay and the Caribbean cruise for one low price. Unlike other cruise packages, this is a per couple price, not per person! Are there any other cruise expenses? Cruises remain one of the best vacation values – providing accommodations, onboard activities & entertainment, as well as most meals and snacks. Your only extra expenses might include alcoholic drinks, onboard specialty restaurants, optional shore excursions, spa services and optional incidentals purchased onboard or ashore and gratuities of about $14 per passenger/per day.